Monday unchanged.... a holiday. Long cycle (Wall) topped and is now down. The shorter cycle (2.5 week - 12 TDs) is down. the 5 week cycle is up and should top as the first week of June arrives. The 10 week cycle is up. So with 2 cycles down and 2 up expect more sideways action, but I would expect a wider range than the week just ended. Possibly some downside bias as we enter June? Our indicators (TSI and CCI) are turning negative as well. "So with 2 cycles down and 2 up expect more sideways action" - first 2 trading days up/down. so far for the week. " but I would expect a wider range than the week just ended" - volatility for Tue/Wed definitely more than prior week..
"Possibly some downside bias as we enter June?" So far DOW down about 100 points for the week. 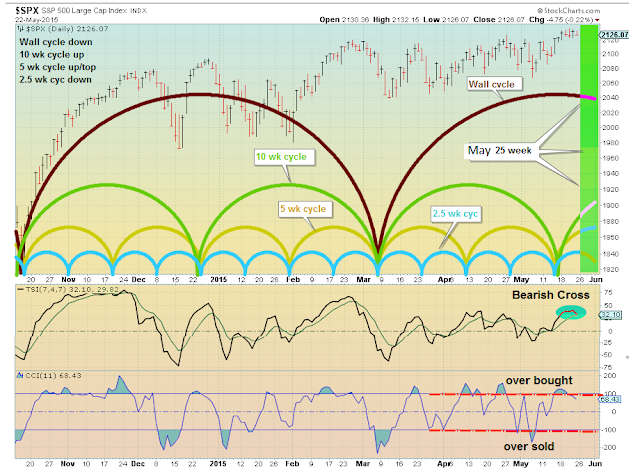 May 18 weekly outlook I said: "By the end of May we may be into a real correction (sell in May and go away?) ". Starting to look like a good call.... Guess we find out how June plays out before we declare it a correct call.